Monica Lewinsky, who has guarded her privacy since her affair with President Bill Clinton became a sensation in 1998, is now tweeting. Lewinsky fired off her first post on Monday, announcing her presence with the hashtag #HereWeGo. Lewinsky delivered a speech in Philadelphia later in the day. She called herself "the first person to have their reputation completely destroyed by the Internet," the New York Daily News reported. "There was no Facebook, Twitter or Instagram back then," she said. "But there were gossip, news and entertainment websites replete with comment sections and emails which could be forwarded. Of course, it was all done on the excruciatingly slow dial up. Yet around the world this story went. A viral phenomenon that, you could argue, was the first moment of truly 'social media.'" Lewinsky's speech largely echoed an essay she wrote for Vanity Fair in June, and the magazine welcomed her shortly after her first tweet. 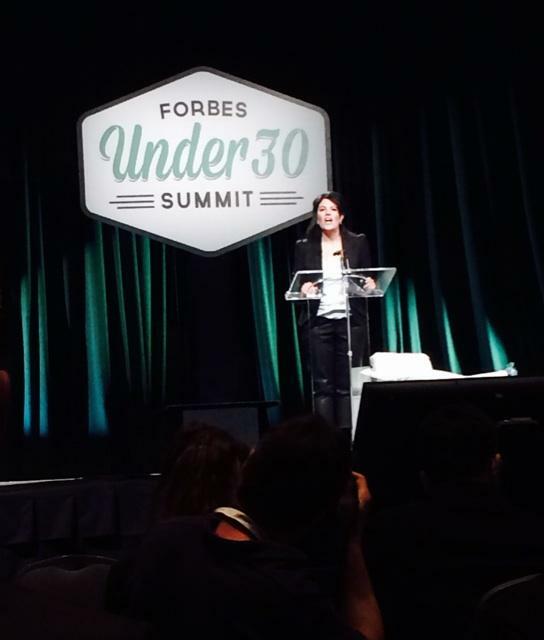 Incredible to watch @MonicaLewinsky give a brave and eloquent first public speech at the @forbes #under30summit. She received the blue checkmark signaling her account was verified by Twitter. Lewinsky became increasingly active in public life in 2014. In June, she said she wanted to put her head "above the parapet" so that she could "take back my narrative and give a purpose to my past" in her essay for Vanity Fair. In July, she granted her first TV interview in several years as part of a National Geographic '90s special. Earlier this month, a number of documents revealed the great lengths the Clinton administration went to to weather the Lewinsky scandal, including attempts to attack the media and discredit rivals.